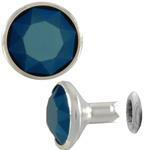 Hold things together in style with rivets covered in Crystal, pearl, and Swarovski rhinestone. Rivet Setting Equipment available here as well. A cool new look, Swarovski crystal in a spike rivet! Beautiful Swarovski rhinestone rivets come with a genuine Xillion Cut 1028 brilliant rhinestone set in them for maximum sparkle. 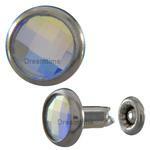 At Dreamtime Creations we carry a full line of Swarovski rivets! A beautiful new rivet by Swarovski made with their famous crystal pearls designed to add elegance to any design!